Document capture solutions play an important role in helping businesses collect, store, and manage important documents. Capture technologies continue to evolve, which requires businesses to take advantage of the solution that fits their particular needs. 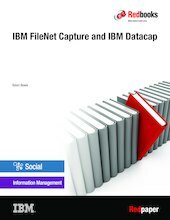 This IBM® Redpaper™ publication explores the capabilities of two key document capture products: IBM FileNet® Capture and IBM Datacap. Each product has common and distinct capabilities that fit the needs of their customers. The paper uses a specific document capture scenario to look at each product and show how they fit the needs of the situation. In the scenario, a bank is looking for a way to acquire and process bank statements by using a solution that must fit their specific and well-defined capabilities. Both FileNet Capture and Datacap products are explored in-depth to determine how they satisfy the scenario requirements.